10670802 Ocean Paradise, Perfect for 2 - We will be back!! We are SO thankful to have found this place in Kappaa! We were over the moon with the accommodations and realized more and more as the week went on what a little piece of paradise the location and beach truly is. Weve rented a number of VRBOs in the past and on occasion, the photos are enhanced - that is not true here, what you see is what you get. You are literally steps from the beach and have better views than most high-end resorts. The unit is furnished with everything you need and is very updated - it enabled us to do some meals on our own but it was also walking distance to a number of cute places to eat, have a coffee or a cocktail. As a bonus, the owner has provided beach chairs, blender, umbrellas, beach towels, coolers, etc - all the extras making it hassle-free! We visited a number of other beaches and parks during our stay and each time ended up appreciating the beach at the unit even more - its uncrowded, has little tide pools for swimming and enabled us to see monk seals, sea turtles and many birds from the porch. You cant go wrong if you stay here - there isnt one thing we would change about this place! Nice, prefect get-away condo This place had everything we needed - great location by the beach, centrally located on the island so that it took about an hour or so to get to the very end of the north side of the island or the very end of the west side of the island, and located at Coconut Marketplace so it was easy access to shops, grocery stores, and restaurants. Inside, the condo was very neat and clean, and provided all the amenities we needed like dishes & utensils, towels, games, and beach equipments. Everything about this condo was so convenient for us. Only thing that was a little frustrating was that some nights it was hard to find parking. Howver, would stay here again. Perfect get-away condo to relax and enjoy the island! Beautiful condo and resort What a beautiful condo 170 is, with so many extras. The condo was perfect in so many ways, with everything we needed for our stay from boogie board, beach chairs to coffee and tea every day. Being on the bottom floor was a dream, with easy access to the beach just a few steps away. There is an amazing feel when you are in the condo of the gorgeous tropical gardens and ocean right outside your door. The condo was upscale, and made us so comfortable, and so well stocked. The location at the Coconut Coast was perfect for us, with everything on island only a short drive, and these amazing falls just 10 minutes away. We loved going to the Coconut Marketplace for breakfast at Eggberts and watching the Hula Dancers. This condo is a gem, and we will be coming back! Outstanding ! Our stay at condo 170 was perfect. The room was a perfect size for my wife and I. The amenities were awesome,beach chairs,body boards,cooler,wireless internet. The location on the island is great, centrally located and easy to get anywhere. In the resort it has a great location also, on one end of resort so you do not get alot of people walking by,very close to parking and laundry. The picture on review is from the Lanai.We will be glad to stay here again. Thank you for the gift bag that wss very thoughtfull. We Loved It! As many-times returnees to IOB, we were pleased to find that it is still wonderful! Unit 170 was perfect for our needs. Beautifully furnished, clean and well-stocked in a great location. We do wish that all of the coffee provided was not decaf, but that is a small thing. Every single other thing we needed to make us comfortable was there at our fingertips. We loved breakfasting every morning on the lanai, looking out at the lovely grounds and the ocean, planning our day.The beds are so comfortable we slept like babies. The only thing we dont like about it is that were not still there! Wonderful Place to stay, peaceful, practical and perdylicious (I We thoroughly enjoyed our time in Condo 170 at the Islander on the Beach. It was a beautiful setting with a nice pool and hot tub, close to the ocean, clean and decorated with fun beach stuff! You will love the location near town, but not in it. You can walk on a path near the ocean, relax by the pool or go explore this amazing island. The room is small but practical. You have a microwave, coffee maker, refrigerator, kitchen sink and dishes. You dont have an oven or stove top in the room but they provide gas grills by the pool which work very well. We grilled out and loved it. The staff was very nice and you have access to a nearby laundry on the property. We highly recommend this condo! Kauai is truly the "garden isle" Condo 170 at the islander was more than we had hoped for. It was clean, comfortable, with all kinds of amenities. If we had more time we would have liked to stay longer. We would definitly stay here again on another trip. Thank you for your hospitality which was so evident. Great place to stay! This condo was very easy to find, check-in process was very straightforward. Dawn was easy to work with providing all of the needed details promptly. The place was clean and came furnished with some nice extra amenities. All around a great place to stay. Perfect !!! Unit 170 exceeded all my expectations. The unit was welcoming, immaculate, with comfortable chairs and two large wonderfully luxurious beds. The comforters,pillows and fine sheets were so tastefully chosen. The owner thoughtfully included everything we needed. We loved having beach chairs, beach towels and even a cooler. Unit 170 is situated near parking so nothing was a problem to carry. We often brought back food from the marketplace,only steps from the condo, and ate on the lanai. The landscaping is beautiful and well maintained. I can only give accolades to this small piece of paradise and look forward to returning very soon.. Most wonderful vacation of my life! Having sailed and swam all over the world, I must say this is the most gorgeous place, beach and warm waters, as well as the perfect home away from home that Ive ever found. The condo is charming, well equipped with ocean view and a lovely outdoor patio for morning coffee or evening drinks. Beach is long, not crowded, wonderful swimming. In addition a gourmet restaurant overlooking lovely landscaping and the ocean is just a 5 min walk away on the beach. Next time I go I[m not even going to bother to take a car. I feel blessed to have found this place in paradise This condo is a perfect place from which to enjoy the magic of Kauia. You wake up to the sound of the ocean and a myriad of birdsong. It is a short walk to a long sandy beach where you can sit in the shade or sun on comfortable lounging chairs and watch the waves and gorgeous view. The condo is neat, comfortable and cozy with all the necessary amenities, and there are wonderful restaurants near by so you never have to get in a car. There are wonderful sites near by but in a weeks stay I only wanted to leave the area for a couple of days of adventure, as it was so peaceful and beautiful where I was. It felt like coming home. I highly recommend it. Exquisite !! I have stayed at the Islander on the Beach over 20 times in 5 different buildings but this is my favorite.Easy access from the parking lot is one reason but the owners individual touches and thoughtfulness make this a winner.No resort fee and free high speed internet as well.Best location halfway between Waimea Canyon and Kee Beach. Comfort and convienence on Kauai Ahhh. Our stay at the Islander Unit 111 was everything we had hoped for. As long time "Northshorers" we decided this time to try an East-side location. Islander 111 was perfect for us. Location? How about 30 seconds from the pool and poolside bar and 45 to the beach. Excellent restaurants and other fun bars within walking distance. The best way I can explain how pleased we were would be a review of the odometer on our rental car. On the 5th day we finally exceeded 50 miles. When we got to our room we needed to go no further to find comfort and joy. Warm hospitality received! The studio was all that my daughter & I needed for our spring vacation getaway, it was well stocked and we loved the welcome goodies. The central location was great to venture out to either end of the island depending on the weather. Maryann was wonderful and provided us with lots of tips and was always quick to assist us or answer questions if required. Thanks for a great stay! Excellent place to stay!!! I had a great vacation! The condo was beautiful and well stocked. Excellent location with plenty of places to eat. I would recommend staying here! Wow!! This condo is beautiful!! Much different from the other condos I have stayed at, at this resort. It is very upscale with beautiful furnishings and an amazing view. We were able to sit in these beautiful chairs and watch the ocean. Being on the second floor we left our door to the lanai open and night and listened to the waves. The check in and out process was super easy. Great location on island being centrally located made it perfect for us. This condo is cozy and beautiful. I highly recommend this condo. Excellent!!! The room fit the bill perfectly. Clean, well equipped, and well maintained. Plus her rooms (Dawn), are in great locations. Thank you Dawn. Paradise Found!! Love this unit! I have stayed at the Islander many times, and this unit is the best ever! All the special touches and beautiful furnishings made our stay so enjoyable. They have guide books, and a great binder showing some special places on island. The view of the ocean is amazing, and being on the second floor we left our door open and listened to the waves... love it! It is the perfect location to do everything we wanted on island with everything being close by. We could walk to the Coconut Marketplace to eat, see some live music or Hula shows and shop. I will be coming back to this piece of paradise. Love, love, love this unit! Tropical Paradise Beautiful and cosy unit with fantastic location right next to the beach - the view from the third-floor balcony is really special. Super easy access, able to come and go with no hassles. Free wi-fi included was really fast. 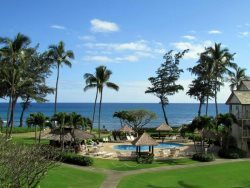 Situated in the middle of the east coast of Kauai, its perfectly placed to spend a day exploring either north or south. Loved the little touches to make it feel homely like the welcome basket and free use of boogie-boards, beach chairs, beach towels and cooler bag. Room with a view! What a lovely unit! Everything you would need was in the room, right down to the BBQ tools! We appreciated the binder of info, the drawer of games, plush bath towels, comfy bathrobes, beach chairs/beach towels/coolers and boogie boards! There is a great TV, DVD player, CD player (with music Cds) and free Wifi to use! Awesome! The bed was comfy but we found the pillows a bit too firm. We loved that the Coconut Market was so close by. Being located on the central, east side of the island, made it very easy to drive to other areas of the island. Safeway, Wal-Mart, Costco, Starbucks and various malls are close by as well. Not with-in walking distance but just a quick drive away. The airport is only about 7 miles away! Talk about convenience. Very nice condo rental - no surprises - lots of extras included My wife and I rented Condo 361 at Islander on the Beach for 6 nights in Jan/13 and would highly recommend this unit to others. For a $99 per night rental, you cannot beat the quality of the unit, the location, and free extras provided. The unit was well equipped and was not outdated or worn out in any way. The extras such as dishes & utensils, blender (fresh fruit smoothies), insulated lunch bags (for picnics on isolated beaches) boogie boards and beach towels were appreciated and well used. Bath towels and amenities were well stocked and the king sized bed, sheets and pillows were very comfortable, even for my wife with a bad back. The beachview location allowed us to whale watch from the lanai and early morning walks along the beach to watch the spectacular sunrises were terrific. The tourist channel on TV was very informative re restaurants and secluded beaches to visit and other sites on the island to see. For the price, you cannot beat the value of Condo 361.